The day was more like April than July but a sunny atmosphere prevailed inside. One vital component of the two talks was Andrew our sound and vision man for the day as both talks relied heavily on digital presentations – he did a sterling job. Rick the sewing machine “doctor” was the morning speaker. Although he stressed that he worked purely with Bernina machines most of his information applied to sewing machines in general. He began by showing some old machines and explained the basic principle of how a sewing machine actually works with the aid of very clear visuals. He then showed the progression and development which resulted in the modern machines we use today. The main point of his talk was to stress the need for us all to be pro-active in cleaning and maintaining our machines. This does not do away with need for professional servicing but can make it less often. Rick gave us many useful tips which are detailed in a separate article. Rick finished with what he called his “rant” which was directed at engineers who purport to do full services on machines but do not. There were pictures, which were frankly disturbing, of machines which had supposedly just been serviced and were still quite dirty or had only been cleaned in areas visible to the customer. Clearly, Bernina owners can rely on Rick to care for and nurture their machines but as for the rest of us ………. Our afternoon speaker, Alicia Merrett, charted her journey from making dolls and teddy bears through art quilts to the map quilts she is known for. Although she found herself attracted to the fabrics she used for making doll’s clothes it was several years before she ventured into patchwork. She did not like traditional piecing with its straight lines and perfectly matching corners but then discovered art quilts with their abstract design and vibrant colours. Her comprehensive digital presentation encompassed the whole range of her quilts. She works mostly in series inspired by such diverse subjects as music, Shakespeare, magic, texts, maps and my particular favourite – ColourScapes with its bright buildings. 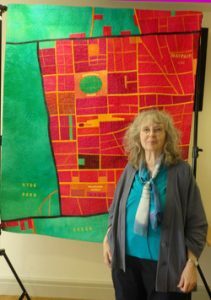 The maps series comprises quilts based on ancient maps in bright modern colours and on imaginary maps. The latter was the subject of the Sunday workshop and I am sure we are all looking forward to seeing the results.